In a survey of the sky, WISE found more brown dwarfs farther from the sun than it did nearby. In this image of our astronomical back yard, shown from a the view of 30 light-years from the sun, brown dwarfs within 26 light-years from the sun are circled, with objects in blue having been previously identified, while red circles indicate new brown dwarfs revealed by WISE. Nemesis is a theoretical dwarf star thought to be a companion to our sun. The theory was postulated to explain a perceived cycle of mass extinctions in Earth's history. Scientists speculated that such a star could affect the orbit of objects in the far outer solar system, sending them on a collision course with Earth. While recent astronomical surveys failed to find any evidence that such a star exists, a 2017 study suggests there could have been a "Nemesis" in the very ancient past. In the early 1980s, scientists noticed that extinctions on Earth seemed to fall in a cyclical pattern. Mass extinctions seem to occur more frequently every 27 million years. The long span of time caused them to turn to astronomical events for an explanation. In 1984, Richard Muller of the University of California Berkley suggested that a red dwarf star 1.5 light-years away could be the cause of the mass extinctions. Later theories have suggested that Nemesis could be a brown or white dwarf, or a low-mass star only a few times as massive as Jupiter. All would cast dim light, making them difficult to spot. Scientists speculated that Nemesis may affect the Oort cloud, which is made up of icy rocks surrounding the sun beyond the range of Pluto. Many of these chunks travel around the sun in a long-term, elliptical orbit. As they draw closer to the star, their ice begins to melt and stream behind them, making them recognizable as comets. If Nemesis traveled through the Oort cloud every 27 million years, some argue, it could kick extra comets out of the sphere and send them hurling toward the inner solar system — and Earth. Impact rates would increase, and mass extinctions would be more common. The Kuiper Belt, a disk of debris that lies inside of the solar system, also has a well-defined outer edge that could be sheared off by a companion star. Researchers have found other systems where a companion star seems to have affected the shape of the debris disks. The dwarf planet Sedna lends further credence in the eyes of some to the existence of a companion star for the sun. With an orbit of up to 12,000 years, the planet presents a puzzle to many. Scientists have suggested that a massive object such as a dim star could be responsible for keeping Sedna so far from the sun. Another theory is there is a huge ice giant, nicknamed "Planet Nine," that is at the edge of our solar system. Researchers Konstantin Batygin and Mike Brown (both from the California Institute of Technology) suggested in 2016 that such a body might be stirring up smaller icy bodies in the Kuiper Belt. A search for Planet Nine is ongoing. Notably, Brown was part of the research team that found Sedna and several other icy bodies in the Kuiper Belt, and he was one of the lead advocates for reclassifying Pluto (once considered a planet) to a dwarf planet in 2006. Though some scientists find the Nemesis theory plausible, others do not. The initial cyclical nature of mass extinctions is still under discussion. Studies of craters seem to indicate that such a pattern does not exist. Other studies of fossil records suggest that mass extinctions are more likely to happen around those peaks, though extinction events occur during other epochs. In order to avoid significantly affecting the orbit of the planets, as well as to avoid observation, Nemesis must remain at a distance from the sun. But astronomers argue that such an orbit would be inherently unstable. Traveling so far out, Nemesis would be affected by other stars moving through the galaxy. The resulting orbit would not provide a steady kick to the Oort cloud but would be constantly changing. In 2017, a new study suggested that nearly all stars like the sun were born with companions. The astronomers did detailed studies of young stars in the Perseus molecular cloud and backed up their work with modeling. But "Nemesis," if it did indeed exist at that time, broke free of the sun early in its history and moved into the rest of the Milky Way's population, the astronomers said. A solar companion may be hard to find, but it would still be visible by sensitive telescopes. 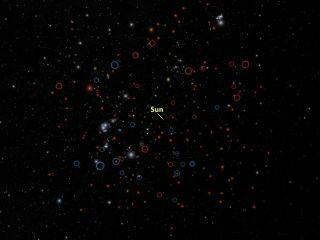 Astronomers have scoured the sky using the Two Micron All Sky Survey (2MASS), which studied the sky over four years in three infrared wavelengths. The instrument discovered 173 brown dwarfs farther away than our solar system, but none near enough to be the infamous Nemesis. NASA's Wide-field Infrared Survey Explorer completed its 1.25-year mission in February 2011, having discovered a number of brown dwarfs within 20 light-years. Again, none of these were located near the solar system. The lack of discovery of a viable candidate by these two sensitive instruments led many scientists to conclude that the sun is a single star and does not have a companion.